Revenge, with a capital R, was what last night’s game was. It would’ve been much more effective had the Angels not scored almost half the runs that we did, but with the way we’ve been playing lately, we’ll have to take what we can get and like it. But still. The final score was 17-8. And that’s what you call a good, old-fashioned Boston beat-down. Mr. Clay Buchholz led the charge. He was one out shy of pitching a full six innings. He gave up four runs on eight hits, walked three, and struck out two while throwing 109 pitches. So he kept his pitch count relatively low, although if you ask me he should’ve gone deeper and given up less runs. He obviously wasn’t on. He topped out at ninety-seven miles per hour on his fastball, but it just wasn’t as effective as usual. The overwhelming majority of his pitches were fastballs, followed by sliders and changeups with the occasional curveball. He threw the first three pitches for more or less the same strike rate, which wasn’t very high. He had a good time of it during the first and third innings, but otherwise he was just mediocre. And his strike zone more or less even, but there was some spillover out of there. So the movement on his pitches could’ve been better, and his command could’ve stood some improvement. To be fair, he battled and picked up the win, and if he had his way, the Angels would’ve finished with the four runs and that would have been it. Delcarmen got a hold, and he and Ramirez pitched perfectly. It was Schoeneweis who had other ideas; dude gave up four runs in the top of the ninth. And with the way we’ve been playing recently, you can’t not be furious about that. Why? Because had this been a close game, Schoeneweis probably would’ve lost it for us right there. You just don’t give up four runs in the top of a ninth inning. You just don’t. Because that likely means you’re done. Four runs on four hits with two walks. That’s completely uncalled four. Luckily, we had runs to waste. Which brings me to the fun part: how we got the seventeen runs, and I can assure you it was an absolute blast to watch. Pun most definitely intended. So, to start things off, Youk belted a home run in the bottom of the second. His first at-bat in the lineup and he smashes a fastball up the middle completely over the Monster. And all Mike Scoscia could do was just watch that go. He did well batting clean-up, finishing two for three with a double and two walks. Three batters later, Hall stepped up with Beltre on base and belted one of his own. His first home run in a Boston uniform was kept within the Monster seats by inches. Inches, folks. It was a changeup down in the zone and he just made that look easy. He just got up there, took his cut like it was the easiest thing in the world, and just like that two more runs were on the board. He had to reach way down for that and kind of just poke it out of there. He finished two for four with a walk. Then, in the third, Lowell doubled in two. In the fourth, Drew singled in two. And that brings us to our seven-run sixth. Drew singled in Youk. Lowell doubled in Drew. Beltre smacked a two-run shot for his first homer of the year. That landed in the back of the Monster, and let me tell you: he was swinging for the fences. Cue the usual dugout ritual for first home runs. And finally, the big one that cemented this game as out of reach for the Angels: Dustin Pedroia the Destroyah’s not one, not two, but three-run monster shot into that same-named wall. The first row. That swing was huge. He uncorked massive power on that ball. Why pitchers continue to even think that they might be able to get an inside fastball by Pedroia is completely beyond me. To this day, I have absolutely no idea why they still think they can do that. No idea. So all the home runs landed in our outside of the Green Monster. That’s a lot of power in those swings. It’s not easy to launch balls over there. We added three more runs in the seventh just to make sure they got the message. Lowell and Beltre each doubled in a run, and Beltre scored when McDonald grounded into a fielder’s choice. Every single member of the starting lineup got a hit. All but two had multi-hit games; Scutaro just hit a single, and Pedroia we’ll forgive for not hitting more because, come on, three runs scored on his one swing. V-Mart went two for six with a double, Beltre went two for five (and made an error), and McDonald went two for four. But guess what. Drew went four for five. I’m not kidding. And Lowell went four for four with three doubles. Three! Man, talk about hot hitting! On Sunday, he struck out twice and hit two dribbling nothings in front of the plate. But Lowell just gave Tito something to think about lineup-wise. And, of course, Drew’s April blues are officially over, if that wasn’t established already. Seventeen runs on twenty hits. How ‘bout that. And that, my friends, is how you open a ten-game homestand against two of, I hate to say it, the toughest teams in baseball. Goodbye, three-game losing streak; hello, one-game winning streak that will hopefully expand. And, you see? That’s what happens when everyone plays to their full potential; we can afford to be gutsy and take some risks because we’ve got plenty of insurance. We won by nine runs; that’s the first time we won by more than two since we beat the Twins, 6-3, on April 14. I would just like to put that bad baseball behind us once and for all; maybe this is the homestand to do it. If we do really well against tough teams, it might be just the thing we need to find our groove. Last night’s performance was certainly heartening for exactly that reason. And let’s remember that we don’t have to deal with Lackey anymore. Lester’s taking on Santana tonight. Let’s keep this going. Unfortunately, we’ve got some very bad and serious news: Dave Roberts has Hodgkin’s lymphoma. He was diagnosed during Spring Training. Apparently, the prognosis is good because they caught it early. I think I speak for all of Red Sox Nation when I say that we wish you nothing but the best of luck in your fight against cancer and a very speedy recovery. And the B’s just keep rolling right along! One goal in each period, and we won 3-2 in regulation! Milan Lucic, ladies and gentlemen! Next game on Wednesday. There’s still a lot of hockey to be played yet, but all I’m saying is that this is by far the best hockey we’ve played all season. Isn’t that a convenient theme for the week. With all this focus on defense, it’s worth explaining four new fielding stats that helped Theo and other proponents of sabermetrics make decisions this offseason. Baseball is a numbers-heavy game, so anytime new stats come to the fore, it’s pretty exciting stuff. Next is the plus/minus. This is more straight-forward. It awards for converting plays that others in the position in question failed to convert and demerits for failing to convert plays that others would’ve made. Developed by John Dewan, this stat is compiled through extensive research of video footage that maps the location and speed of each ball in play as well as the type of hit that put it into play as well as every other property of a ball in play that you could possibly imagine. Fourthly, we’ve got the probabilistic model of range. This one is my personal favorite of the four. It’s kind of like the ultimate zone rating but accounts for some additional and very important variables. This program, developed by David Pinto, calculates “the probability of a ball being turned into an out based on six parameters: direction of hit (a vector), the type of hit (fly, ground, line drive, bunt), how hard the ball was hit (slow, medium, hard), the park, the handedness of the pitcher, the handedness of the batter.” Here’s how it works. It finds the probability of a ball put in play being converted into an out; this is the number of expected outs. It divides that by the number of balls put in play; this is the expected defensive efficiency rating. Compare that to the whole team’s actual defensive efficiency rating, and you’ve got the probabilistic model of range, the idea being that a team has a good defense if it’s actual defensive efficiency rating is better than its expected rating. I’ll be interested to see how the 2010 Red Sox fare by this metric. Leaving the world of defensive stats and mathematical innovation to itself for moment, we’re going to take a trip back to your high school hallway. You’ll never believe the latest news on the Dice-K front. Apparently, the Boston Globe found out from a Japanese magazine that talked to Dice-K that Dice-K injured his right inner thigh while preparing for last year’s World Baseball Classic. But he didn’t withdraw from the World Baseball Classic because the rest of him felt fine. He actually concealed the injury from Team Japan’s trainers. But the guilt and the physical taxation of his work took their toll, and the rest is history. Honestly, the whole situation resembles teenage gossip way too closely. It’s extremely frustrating. The way I see it, the team shouldn’t have had to find out about an injury that directly affected, its long-term performance from a newspaper that found out from a magazine that found out from the player. At the bottom of this whole thing is cultural differences. In Japan, honor is of paramount importance. So Dice-K felt that his injury was something to hide; he didn’t want to become the center of attention, didn’t want people to worry on his behalf, and didn’t want to make excuses for himself. But we expect someone like Dice-K to be public about legitimate injuries so he can get help. Bottom line? Team Japan got a championship, Team Boston got nothing, and Team Dice-K has some work to do. Theo Epstein deserves a hearty congratulations on never having gone to arbitration with a player. He signed Okajima to a one-year deal worth a bit less than three million dollars, plus four bonus clauses. But he’s got four more filings to deal with: Hermida, Ramon Ramirez, Delcarmen, and none other than Jonathan Papelbon, who of course expects a raise. I think if anyone on that list is going to finally get Theo into an arbitration, it’s going to be Paps. I mean, he’s still the best closer in the game, but after our untimely exit from the ’09 playoffs, I’m not sure that raise is going to be served on a silver platter. [Steroid users] took performance-enhancing drugs to enhance their numbers and make more money. And they did it and made more money and enhanced their numbers. Profound. Although his main point that we should pay more constructive attention to the clean guys of the era who earned their stats than pay all this sensational attention to the juiced guys who didn’t is spot-on. Equally profound was Bud Selig’s proclamation that changes would come to baseball this season. Did he say what sort of changes? No. Apparently that’s not nearly as important as the fact that changes will take place, period. The postseason schedule is likely to be addressed first. Mike Scoscia wants less days off, and Joe Torre wants the division series to be best-of-seven. Fantastic. The GMs who, between them, want more baseball played in less time after a 162-game season are on the panel that’s essentially the brain behind the changes. And last but not least, Major League Baseball has pledged one million dollars in aid to Haiti. That just makes you feel great about being a baseball fan. In other news, the B’s lost to the Ducks in regulation, beat the Sharks in a shootout, and lost to the Kings in a shootout. But that’s not even the sad part. The sad part is that we have fifty-four points, which is good for second place in the Northeast. That’s two above the Senators and ten below the Sabres. Guess how many points the Kings have. Fifty-seven. I’m sorry to have to say this, but we’re actually playing worse puck than the Los Angeles Kings. Of course, life doesn’t look much better from a Patriots perspective. The Ravens absolutely slaughtered us on Sunday, and that’s the end of that. I don’t really feel a need to dwell on the subject. As usual in these situations, I’m going to cut to the completely unjustifiable chase. We’re not getting the All-Star Game in 2012. Kansas City is getting it. I’ll give you a moment to recover from the shock before I continue, because believe me, this was one seriously twisted shock. Okay. Apparently, Kauffman Stadium recently completed major renovations. How nice for Kauffman Stadium. It’s brand-new, nice and clean, and very fan-friendly. Congratulations, Kansas City; now Kauffman Stadium is just like every other ballpark that completes major renovations. 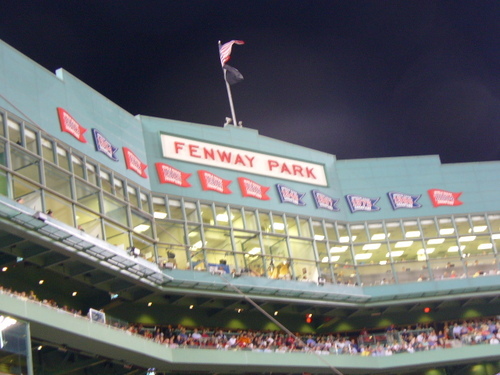 Just to review, the reason why we wanted the All-Star Game in 2012 is because Fenway Park will turn one hundred years old. The oldest ballpark still in use in the United States of America will commemorate a century of baseball. America’s Most Beloved Ballpark will celebrate its one hundredth birthday. Think about what Fenway Park has seen in that time. It’s seen the Royal Rooters, Tris Speaker, Duffy’s Cliff. It’s seen Joe Cronin, Ted Williams, Carl Yastrzemski. It’s seen Nomar Garciaparra, David Ortiz, 2004, and 2007. It’s seen a team of royalty followed by a team that committed cruel and unusual losses year after year after year, followed by royalty’s return. If there is a structure in this country that embodies the history of the game of baseball within its very foundation, it’s Fenway Park. And Fenway Park was denied. Why? I have no idea. What, they can give it to New York because it’s the last year of Yankee Stadium but they can’t recognize that America’s Most Beloved, and oldest, Ballpark will turn a century old? I mean, okay, so Kansas City hasn’t had the All-Star game in forty years and Fenway last had it thirteen years ago, in 1999 when none other than the Splendid Splinter threw out the first pitch. But Fenway only turns one hundred years old once in a lifetime. Kansas City could’ve gotten it in 2013. In fact, it would’ve been okay by me if Kansas City had it every year for another forty years if only we could have it this one time. Something just doesn’t seem right here. I think I speak for all of Red Sox Nation when I say that we are extremely and profoundly disappointed and extremely and profoundly confused. Zack Greinke won the AL Cy Young. I’ll be very interested to see how he pitches next year. I don’t think he’ll be as effective. But I do think Josh Beckett is in line to have a break-out season so dominant that not even CC Sabathia can squeeze past him in the Cy Young voting. Tim Lincecum won it for the NL, becoming its first repeat winner since Randy Johnson. Andrew Bailey of Oakland and Chris Coghlan of Florida were the Rookies of the Year. Mike Scoscia and Jim Tracy of Colorado were the Managers of the Year. I don’t think I would’ve picked Mike Scoscia. In my mind, there were three managers this year who faced significant uphill battles and who powered through them: Terry Francona, and then Ron Gardenhire and Ron Washington. Terry Francona managed us through a lack of shortstop, the entry of a new starting catcher, a decline in the playing time of the team’s captain, a very public steroid scandal, and the worst slump in the career of the figure at the heard of said steroid scandal. True, every manager deals with things behind closed doors, but what makes Tito’s job so difficult is that those doors are never closed completely. It’s the nature of sports in Boston. Gardenhire took the Twins from zero to one-game-playoff winners without Joe Mauer in the first month of the season, Justin Morneau in the last month, or a particularly effective bullpen. And Washington almost made it to the playoffs this year without big-name talent. All I’m saying is that, if the award goes to a Manager of the Year within the Angels organization, it should have gone to Torii Hunter, not Scoscia. He was the real force in that clubhouse. MVPs will be announced tomorrow. Again, not much in the way of business yet. Jason Bay rejected a four-year, sixty-million-dollar offer in favor of testing the free agent market for the first time in his career. He’s Theo’s priority, though, and I still say he’ll end up back in Boston. The Cards have already stated that they’re not interested, preferring Matt Holliday instead. But I think this has the potential to be one of those long, drawn-out negotiations. By the way, let’s not forget that Jermaine Dye is also a free agent. We released George Kottaras, who has been claimed by the Brewers. PawSox manager Ron Johnson will be our new bench coach. We’re reportedly interested in Adrian Beltre, and we claimed reliever Robert Manuel off waivers. Before the offseason is done, we’ll probably re-sign Alex Gonzalez and add a low-risk, high-potential starter. Remember: in an economy like this, you do not need to, nor should you, empty your pockets to win a World Series, no matter what the Evil Empire might assume is the best practice. Congratulations to John Henry on winning the Woodrow Wilson Award for Corporate Citizenship. Again, corporate social responsibility in this day and age is the way to go. Unfortunately, though, ticket prices are up this year. About half the seats were increased by two dollars, including the infield grandstand, right field boxes, and lower bleachers. The field and loge boxes and Green Monster seats and standing room were increased by five dollars. The outfield grandstand and upper bleachers weren’t increased. Whenever you hear about price increases or decreases for tickets at Fenway, remember to always take them with a grain of salt. Obviously we’d prefer a price freeze, but how many of us really purchase our Fenway tickets at face value anyway? I’m just saying. So, as per usual this early in the offseason, we have more wait-and-seeing ahead. Theo never reveals the tricks he has up his sleeve, so that’s really all we can do. The Bruins suffered a particularly painful loss to the Islanders, 4-1. I’d rather not talk about it. We did best Atlanta in a shootout, though, and we eked out a win against the Sabres in sudden death. That last one was particularly heartening, being that the Sabres are first in the division. For now. We’re only two points behind. And now for the grand finale, let’s discuss Bill Belichick’s oh-so-positive judgment call on Sunday. In the fourth quarter with a six-point lead, the Pats had the ball on their 28. Tom Brady’s pass was incomplete. With two minutes and eight seconds left on the clock, Belichick decided to go for it. But Kevin Faulk fumbled the ball, and suddenly it was fourth and two. Needless to say, we lost, 35-34, to the Colts, who are still undefeated. I mean, it’s a tough call. Belichick made the same decision against Atlanta and we won. Then again, we had the lead, we had the time, and we had an opponent that wasn’t Indianapolis. It was just bad. It was just really, really bad. Wow. I don’t even know where to begin. Last night’s game was jam-packed with just about everything you’d want to see in a ballgame and everything you wouldn’t. It was a wild ride. All wild rides come to an end eventually, though, and at the end of this one was the win we’d been looking for. That’s our seventh straight and our tenth straight at home! We are eight and two in our last ten, and we’re a good six and a half games ahead of the Rangers in the Wild Card standings (and that same amount behind the Yankees in the division standings). Byrd was good. He was two outs shy of a quality start. He gave up three runs on nine hits with a walk and a four strikeouts. Torii Hunter led off the fifth with a solo home run, and after recording the first out of that frame, he made way for Saito. Saito proceeded to allow an unearned run. He made his exit after recording an out in the seventh. Ramirez came on and blew a potential save by allowing three runs on three hits. Seriously. If we reduce Byrd’s run-to-hit ratio, he allowed only one on three hits in more than five innings. So Ramirez allowed three times as many runs and couldn’t even get through a full frame. I’m just saying. Okajima pitched the final out of the seventh and to two batters in eighth. Delcarmen came on and was solid. Finally. And he would be the only solid reliever of the night, because Bard, who got the win, gave up a run on three hits before ending it. It was not pretty. Like I said, ugly wins count just as much as pretty ones, but this was definitely one ugly win. And just to illustrate how ugly, the final score was 9-8. A score like that is great for managers and coaches, because you get the win but you still have plenty to talk about with the team. But a score like that isn’t great for the team itself or the fans. Yes, we’ll absolutely take the win, but you can’t expect to go deep in October by playing in a way that relinquishes all sorts of runs to the competition, thereby forcing you to just barely squeak out the W. Games like this are good in moderation because they get a team comfortable with doing that if need be, but games like this are bad if they recur frequently. Good thing that isn’t the case for us. To score our runs, we did a little bit of everything except hit it out. Last night was all about small ball, and if I do say so myself I think we did well with it, given the bullpen’s largely ineffectual shift. We scored five in the sixth and two in both the eighth and ninth. But the two we scored in the ninth were the ones that one it, because without those we’d be looking at a loss or, if we were lucky, extra innings, which would’ve resulted in a loss anyway because Tito already used most of the relievers. Green pinch-hit for Kotchman, even though his left leg, which has been cramping over the past few days, felt very weak, so he wasn’t looking for a dramatic home run. All he wanted to do was keep the game alive. Mission accomplished. Two swings and misses, a checked swing, three fouls, two balls, and a very close call in our favor later, Green was on his way to first. With the bases loaded. With two outs. Next thing you know, Alex Gonzalez singles in the winning run. Game over. Red Sox win. And by the way, that was probably the most memorable walk Green has ever drawn in his entire career. And you could see that he was hurt. His swings were way off the mark, he had to walk it off between every pitch; it was a real battle, which makes it even better. Needless to say, Mike Scioscia was not happy. Hey, if I were him, I wouldn’t be very happy either. Other RBIs for Baldelli, Kotchman, and Ellsbury. Two for Bay, and two more for Gonzalez. Ellsbury went two for four, and Bay went two for five with a steal. Kotchman and Pedroia both doubled. Baldelli made a throwing error and Varitek had a passed ball. Youk and V-Mart were out of the lineup again. Paps wasn’t available last night because he slipped in the bullpen while warming up the night before and hurt his back. This is exactly like that flu epidemic that was going around the clubhouse, but I had no idea back injuries were this contagious. Luckily, it’s not serious. Speaking of back injuries, Wakefield will throw a side session on Friday and could return to the rotation on Monday. So that was one interesting battle of a ballgame. Green battled, the team battled, Scioscia was obviously battling some anger. It was a battle. And it was a very ugly battle to boot. But like I said, a win is a win, which probably didn’t help Scioscia at all. The point is, Byrd confirmed that he’s still a viable option, the offense confirmed it can meet any challenge, and the bullpen confirmed that Josh Beckett’s going to have to go deep tonight because it really needs a rest.